There are times when family history can be quite sinister, and the story of Jacob Neace is no exception. Jacob is the brother of Martha Ann Neace, my 3rd great grandmother and the wife of James Hunley. It seems that Jacob embraced the spirit of rural Kentucky, where a sense of justice and familial pride dominated societal norms. 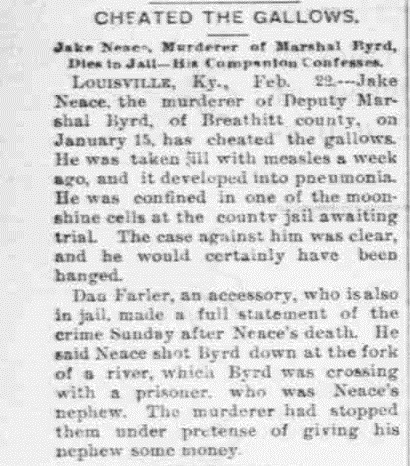 According to the January 21, 1897 edition of The New York Times, Jacob murdered Deputy Marshal Byrd of Breathitt County, Kentucky on January 15, 1897. On that day, Deputy Marshal Byrd was transporting a prisoner named Sam Neace, who happened to be Jacob’s nephew. It seems that Jacob attempted to stop the Deputy Marshal for the purpose of giving his nephew some money. Jacob was never sentenced as he contracted measles while awaiting trial in the county jail. The measles ultimately developed into pneumonia, which took Jacob’s life. The newspapers say that the case against Neace was pretty strong and that he would have been hanged. 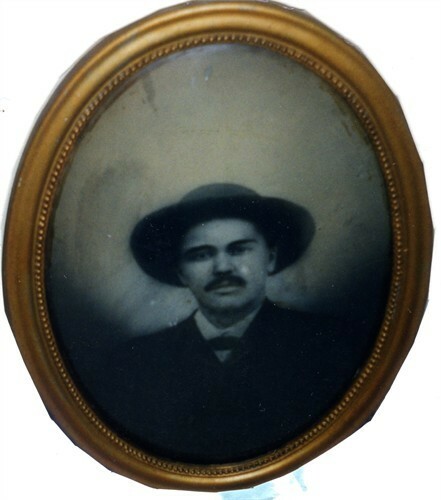 Jacob died on February 21, 1897 in Jefferson County, Kentucky.